Hello there friends! I stopped by the library a couple of days ago to let my daughter pick out a few books to read. My mind really wasn't on picking up something for myself, but the husband talked me into atleast glancing at the fiction. Tucked into the elevator with a couple older gentleman, one of which told me the fiction was on the third floor. The sound of my flip-flops seem to be as loud as canon blasts as I made my way around the corner to start my search for summer reading of my own. It was 10 minutes before I realized I was in the wrong place, though I am sure there is fiction among the foreign language texts! Embarrassed by a few glares, I couldn't make my way noisily back to the elevator, so I dashed into one of the book filled aisles. A deep breath, then my eyes opened onto the bountiful goodness, quilt books! Contentment filled me as I clutched my treasures, no glares could pierce my excitement as my bouncing step made its way to freedom (and the check out counter downstairs). Where should I start from this pile? What is on your side table for reading this summer? Very fun! What a great selection to have at your local library! I have the Tula Pink one -- it's great! Now....that WAS a great find!!!! Enjoy your summer reading. 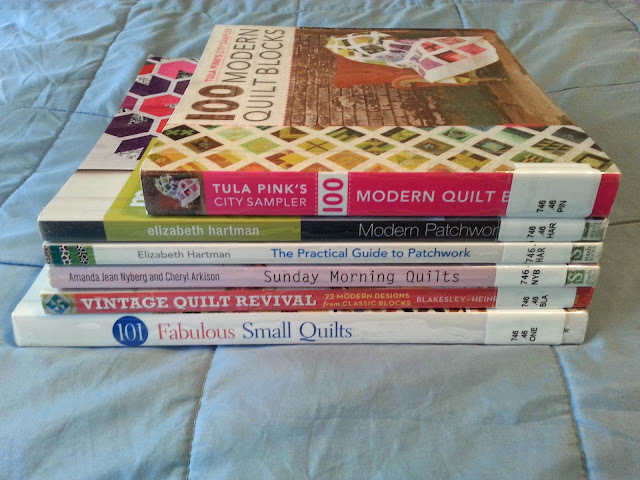 I checked out Vintage Quilt Revival from my library last week. I may have to either check it out again and again, or just buy it. I do well at libraries too. Most books have one big idea, and they take only one reading to "get it." And as Katie says, the others can be checked out again. Not good news for those who would make their living by selling books, but good for me.